Set Up: Groups of 3 with 1 or 2 Pugg goals. First cone is 5 yards from 2nd cone which makes an "L" with 3rd cone 5 yards away. 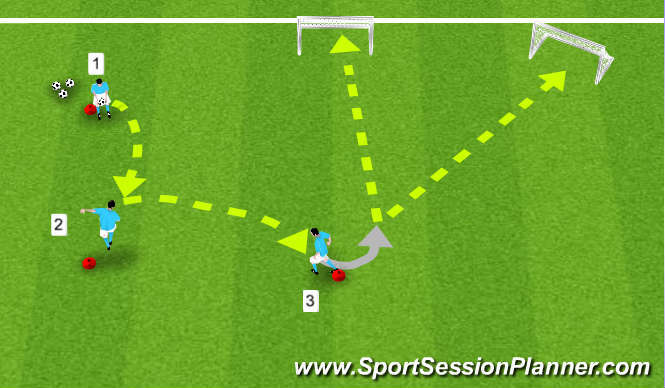 Activity: Player 1 tosses ball in air for Player 2 head and redirect to Player 3. Upon receiving ball, Player three opens up with touch and strikes ball into either Pugg. Rotate players between cones. Coaching Points: Must have good service from Player 1, proper heading technique to redirect, lean towards ball when redirecting header, head down to feet.